A report by the Human Rights Foundation of Turkey (TİHV) shows that a Turkish man who was kept under police custody for 7 days in the wake of a controversial coup attempt on July 15, 2016 lost his mental health because of torture, ill-treatment and trauma. A Turkish public official who said that he was exposed to torture and ill-treatment under police custody for 7 days, applied to the TİHV by stating that he has lost his health. The public officer, who was identified as A.G. and wanted to keep his name anonymous, told the forensic medical specialist who examined him that his health problems had recurred after the maltreatment under police custody. In the report, it was determined that the victim was treated inhumanely and his mental health was deteriorated. Hundreds of people detained after the controversial coup attempt on July 15, 2016 have documented the ill-treatment and torture they were exposed to under police custody. 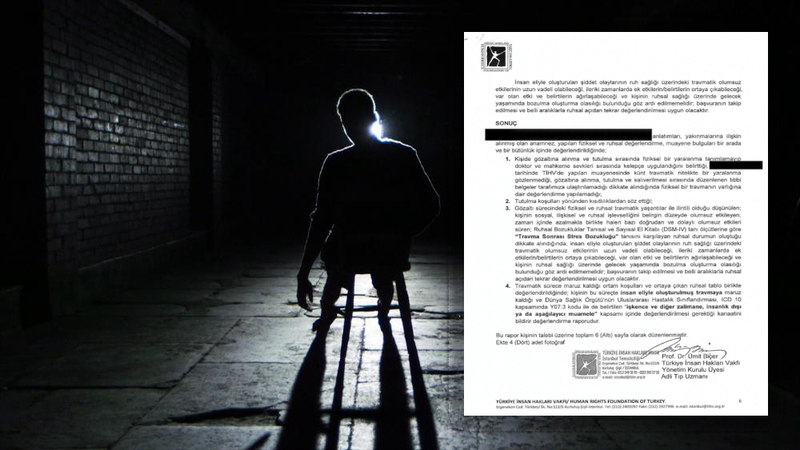 While some of the victims managed to get the tortures written in official minutes by expressing how they were tortured during their stance before the courts, some of them are doing preparations by getting medical reports on torture and ill-treatments in order to call the perpetrators to account. While describing their experiences some of the victims try to keep their names anonymous, the ones who were heavily tortured try to get rid of the trauma and be afraid of exposing the torture for now. According to A.G., who sent his medical report to the SCF, one month after the coup attempt, the police officers came to the public building where he worked in and took him into custody on the grounds that there was an investigation about him. A.G. says he witnessed a torture of a civilian citizen who had been held there 20 days as he was brought to a cell in the basement of a courthouse in İstanbul. He saw that the detention period of this person was extended 5 days each time and then he was asked whether he wanted to take advantage of effective remorse by the prosecutor. According to the report, when A.G. was released by the court, he saw his name was written under someone else’s testimony. Therefore, he applied to the judge to correct this mistake. The response of the judge had been shouting at him and repelled him by saying “Get out of here, you are a member of ‘FETÖ’,” in the corridors of the courthouse. And that had became the last straw for A.G.
FETÖ is a pejorative acronym that Turkey’s political Islamist government and autocratic Turkish President Erdoğan have been using to defame the civic Gülen movement. A.G. told that he could not forget that moment and he was influenced the most by this incident besides other things. He became introverted and he returned to his hometown. He could not go outside and he couldn’t work. From that date on, he started to have headaches, nightmares, insomnia and unintentionally pull of his hair, and on the back of his head began to be bald. Moreover, he had started to scratch his arms with his nails and biting his lips out of will. He could not read books because he had to read the same page many times due to the focusing problem. Thus, the forensic medicine expert Biçer has prepared a report about psychological conditions of A.G., who stated that he no longer wants to live in Turkey because he could not stand being called as a “terrorist”, after examining him thoroughly. Due to the physical and mental trauma that A.G. experienced under custody, Biçer has diagnosed “post-traumatic stress disorder” and wrote it in the report. The report has also pointed out that the traumatic effects of the physical and psychological violence on A.G., the problems in regard of the mental health of detainees may be long-term. The report also underlined that there may be additional symptoms/effects and the available problems could be much more serious in the future. The report suggested that A.G. should be followed up and his health conditions should be reevaluated periodically especially from a psychological point of view. Turkish government accuses Gulen movement followers for the July 15, 2016 failed coup while the group denies involvement. This article originally appeared on the Stockholm Center for Freedom’s (SCF) website on June 3.